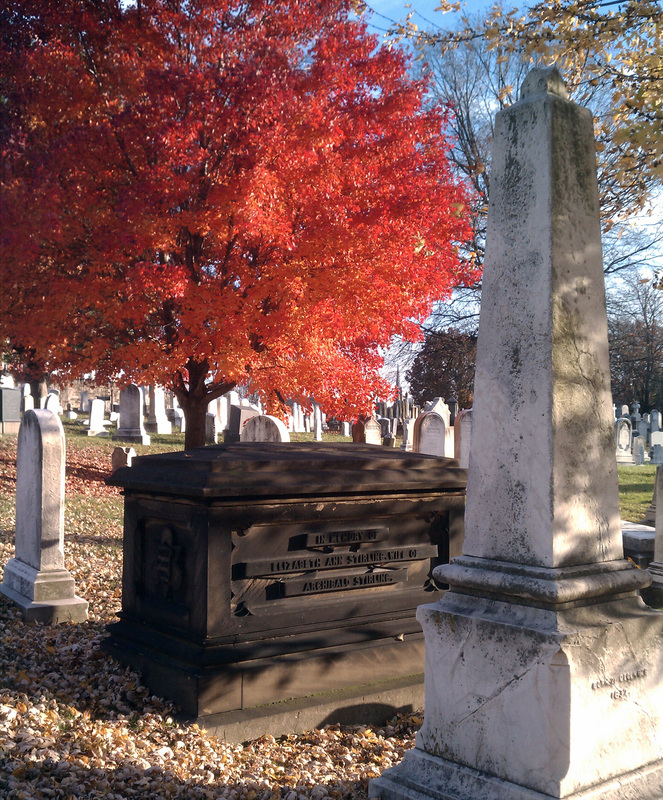 This weekend I walked the picturesque Greenmount cemetery here in Baltimore. 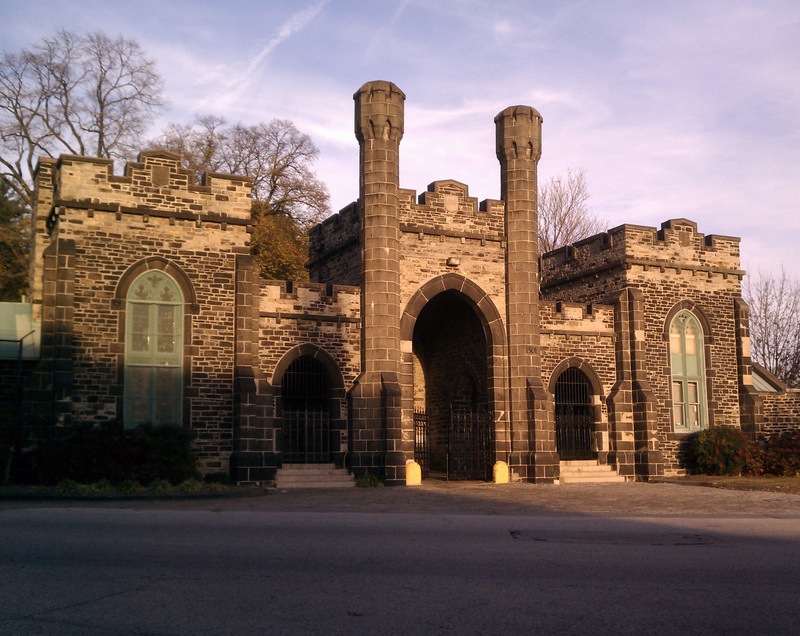 Dating to 1839 and designed by Benjamin Latrobe on a hilly site in then-northern Baltimore, the grounds are a fantastic place to wander for a few hours in late-autumn sunlight. 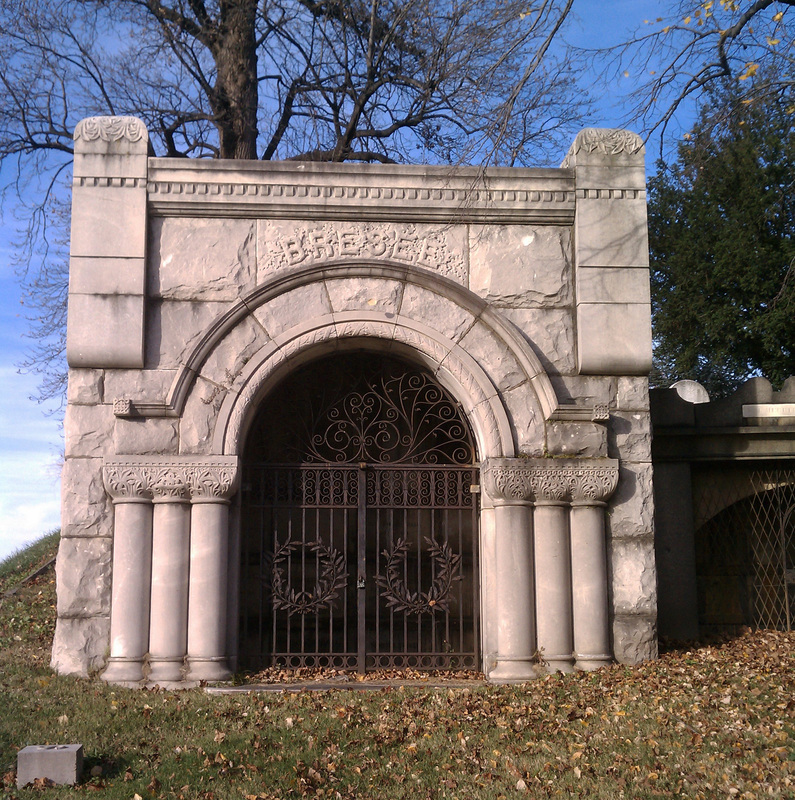 The entrance to the cemetery is at Greenmount and Oliver St, on the edge of the Station North arts district. A long stone wall surrounds the entire complex, with the wonderful rustic gatehouse positioned at the south corner. I arrived a little late and the gift shop/office was closed, so I could not buy a map. I understand the maps are reproductions or at least old-looking, so I will have to go back and make sure I pick on up. I drove this time, and noticed the gate is barely wide enough for my little car. 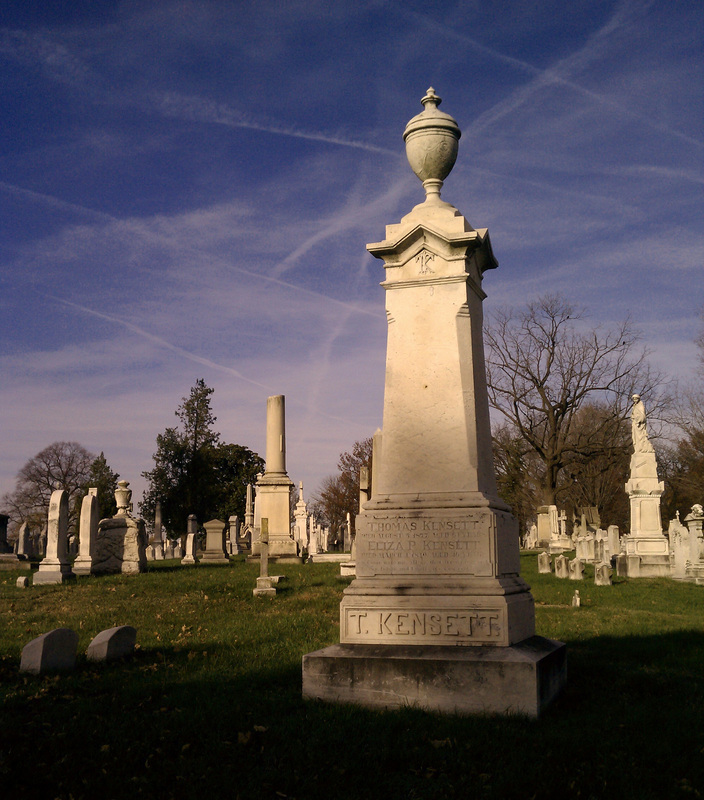 Not knowing the locations of all the famous graves (Johns Hopkins and John Wilkes Booth are buried here, among many famous generals and local industrialists), I just wandered about noting old trees and looking for interesting vistas to sketch and photograph. I love studying trees and often collect leaves and cones from the ground, and sometimes sketch and even measure large trees. 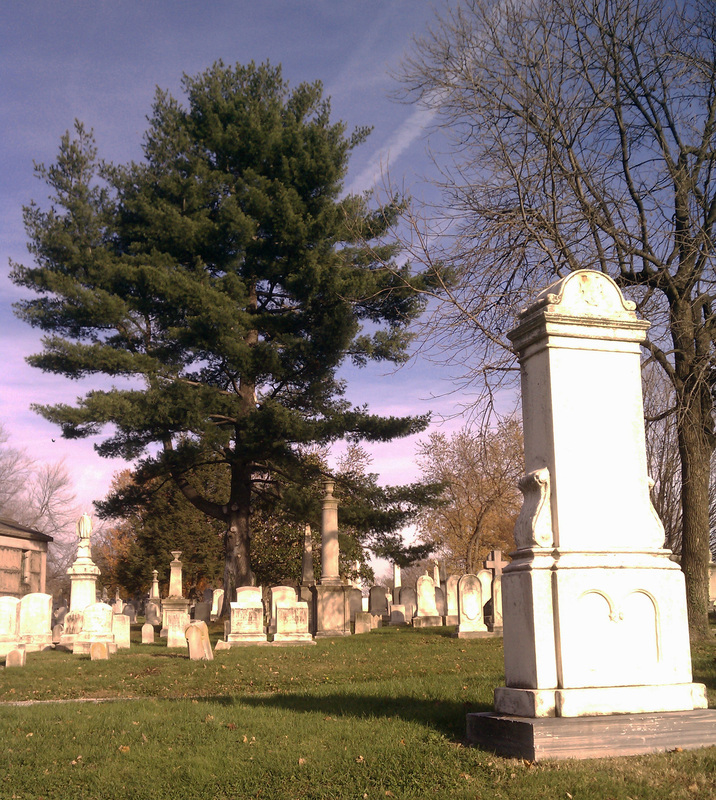 This large eastern white pine was doing well by itself in open sunlight. The fall colors were still splendid, even in middle November. 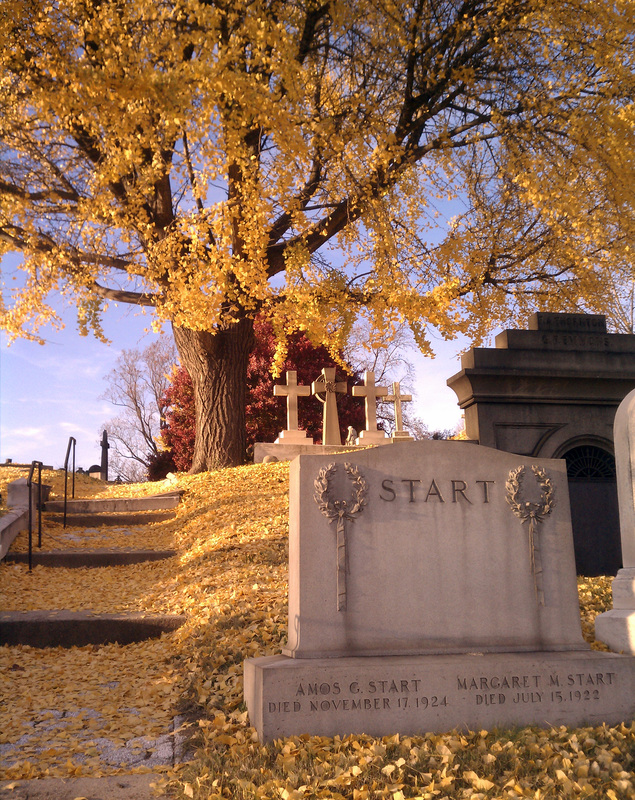 Of note were the ginkos, turning a brilliant yellow with an incredible blanket of fallen leaves on the sidewalks. Greenmount is quite hilly with Latrobe having created many nice vistas on curving, walkable lanes. 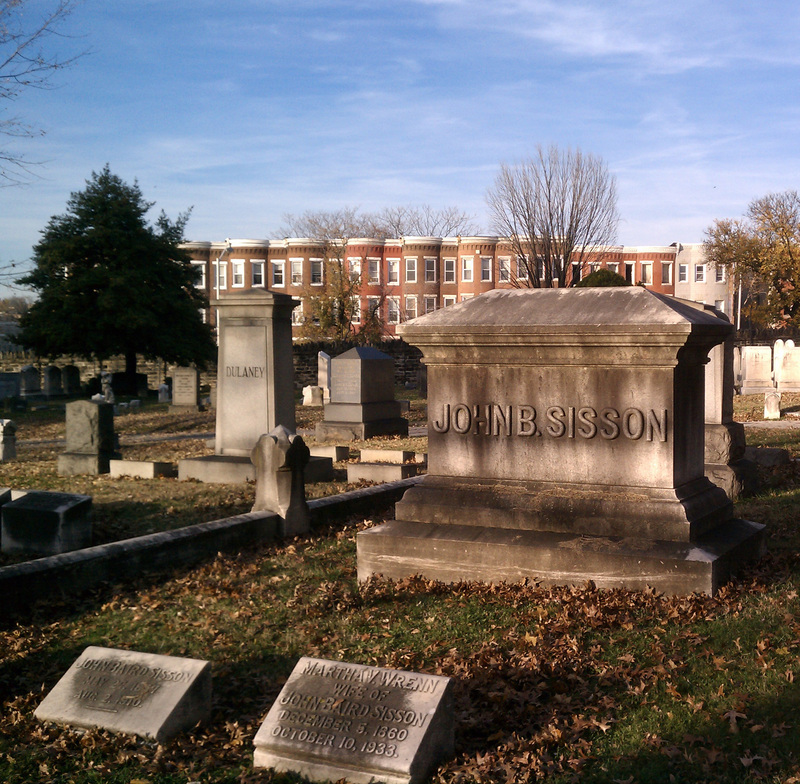 Here are some names that should be familiar to locals; everywhere I looked I thought, Sisson Street, Dulaney Valley… here lie the men who shaped modern Baltimore. Note the row houses in the distance; Greenmount was at the top of the city in the early 19th century but is completely surrounded today. The constant thrum of traffic and occasional sirens remind you how embedded you are, although the sight and sound of hundreds of large crows made it easy to forget the modern world outside the walls. I imagine plots were sold and “populated” randomly over the years. 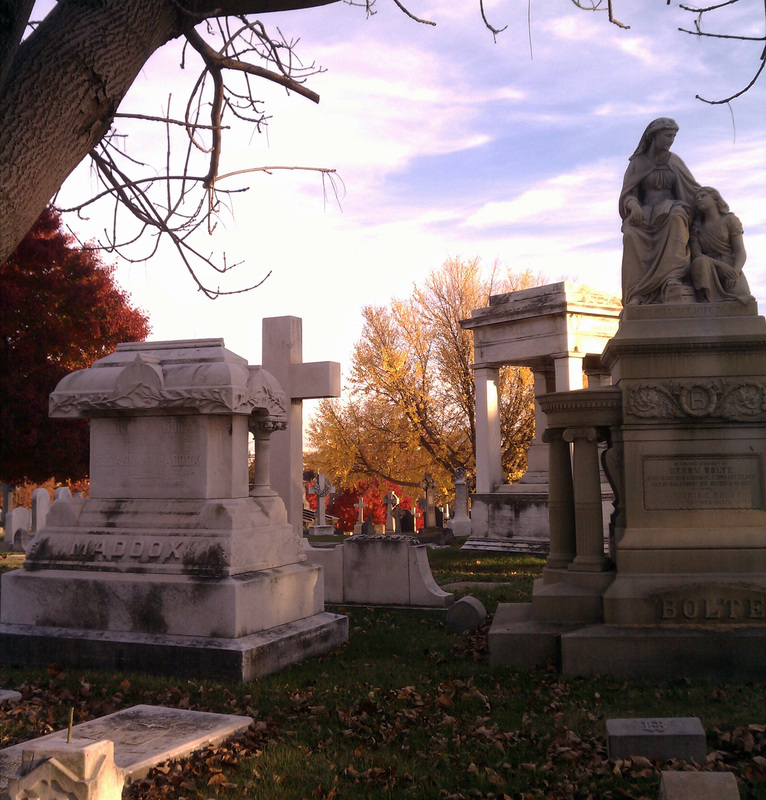 The siting of one’s final resting place was sometimes very carefully planned, especially when it seemed money was not of question. Some areas though, can be a very jumbled mess of different styles and eras, which creates a picturesque, pleasing chaos. 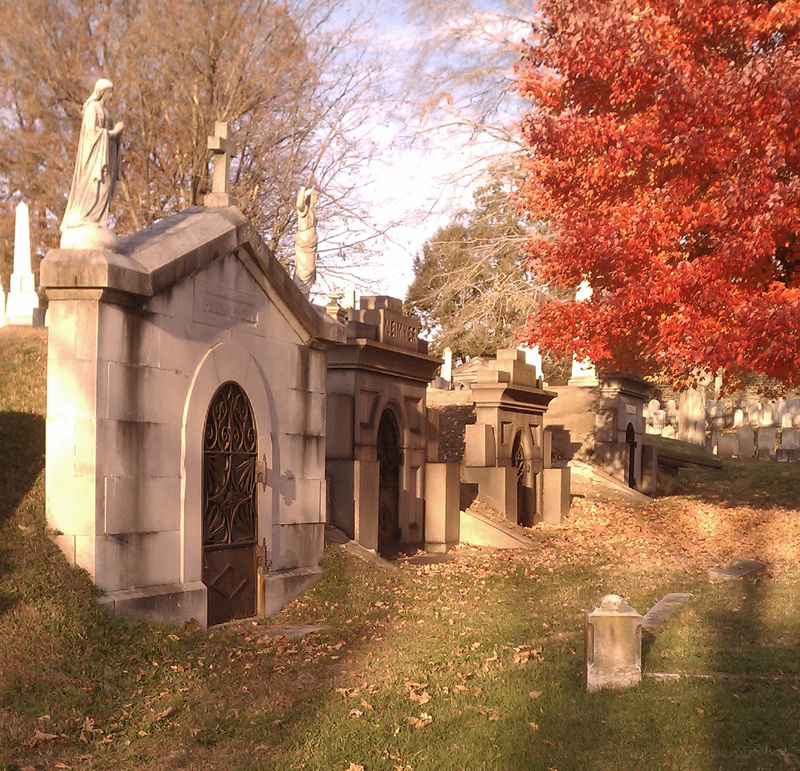 I love the hilly areas and the embedded crypts with decorated facades. I first started noticing this type of grave here in Greenmount but have now seen them in other old cemeteries. 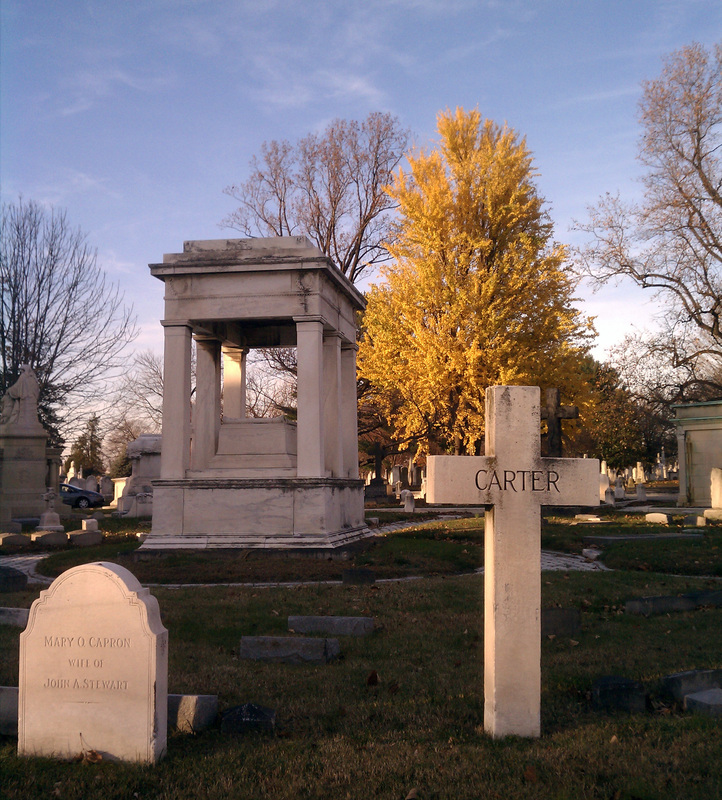 The architecture of mausoleums sometimes followed contemporary trends, and usually looked back to antiquity for a sense of timelessness. 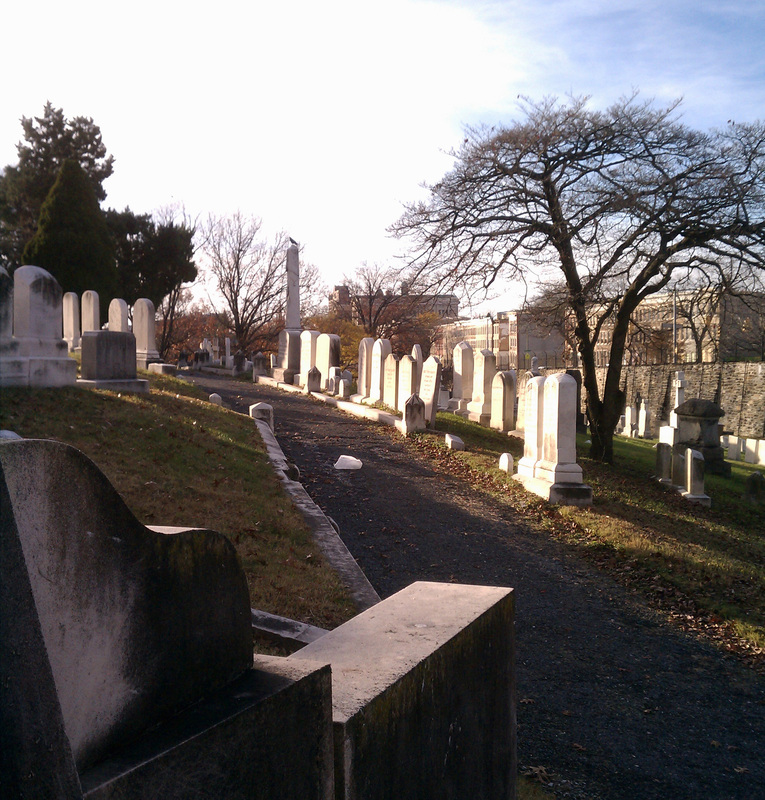 A view towards the northwest corner, showing the elevation change as the cemetery wall abuts with North Avenue and the city beyond. As I meandered my way back towards the entrance at the end of the day, my eye was caught by numerous architectural features and examples of fantastic landscaping. 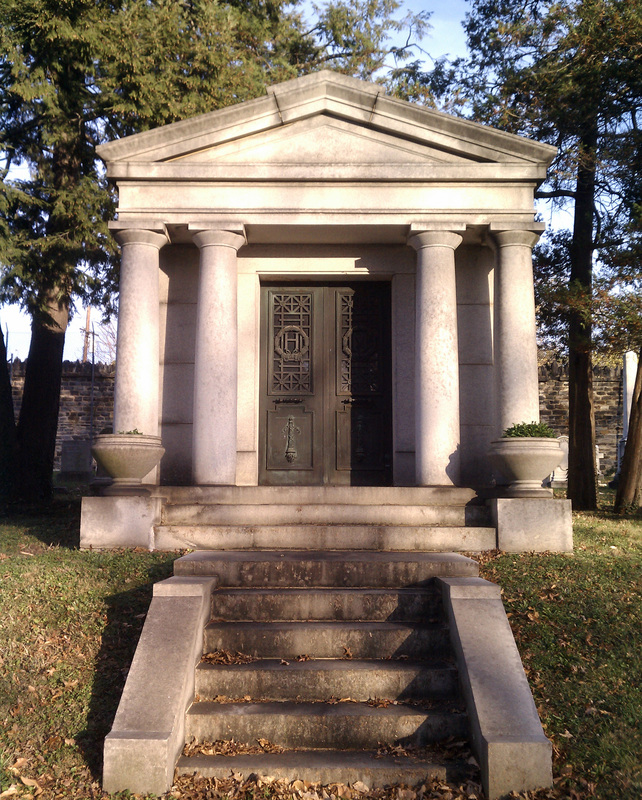 This Doric-order hilltop mausoleum, surrounded by mature hemlocks, elegantly faced the failing sunlight of yet another day. 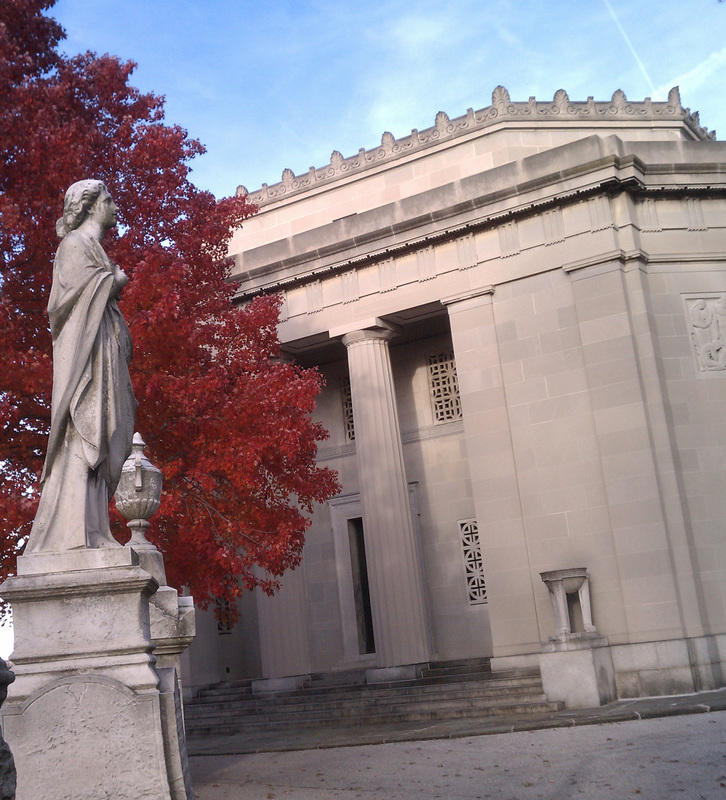 A large public mausoleum rests in the middle of the cemetery, with a large, lovely sugar maple in front. My timing for seeing the maples was rewarded with an exquisite, brilliant red.